Diabetes : Get Checked for Diabetes While Getting Your Teeth Cleaned? THURSDAY, Feb. 26, 2015 (HealthDay News) -- The dentist's office may be a good place to screen people for diabetes, a new study suggests. "In light of findings from the study, the dental visit could be a useful opportunity to conduct diabetes screening among at-risk, undiagnosed patients -- an important first step in identifying those who need further testing to determine their diabetes status," wrote principal investigator Shiela Strauss. She is an associate professor of nursing and co-director of the Statistics and Data Management Core for New York University's Colleges of Nursing and Dentistry. The NYU study of 408 dental patients found that blood collected from the mouth during dental procedures was 99 percent as accurate for hemoglobin A1c (HbA1c) testing as finger-prick blood samples. Testing HbA1c is recommended by the American Diabetes Association for diagnosing diabetes and for monitoring blood sugar levels among those with diabetes. The study was published Feb. 26 in the American Journal of Public Health. 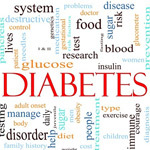 About 8 million of the 29 million Americans living with diabetes are undiagnosed, the researchers noted. While diabetes screening at dental visits can help all people at risk for the disease, those aged 45 and older would likely get the greatest benefit, the researchers said.